A young man is found face down in the dust, dead. His bullet-ridden, bloodstained corpse is surrounded by signs of brutal violence. A handgun is positioned near his right hand; a rifle lays nearby. Oddly, there is no pooling of blood beneath the body, suggesting he was moved. He is positioned in an almost elegant fashion, for a murder, that is. One leg is bent at a near 90-degree angle, and his arms are neatly placed, one outstretched. This is the criminal Salvatore Giuliano. A bandit to some, an outlaw to others, and a hero to countless more, his story is one of legend, the truth of which will take time to unravel. This is the setup of Francisco Rosi's finely crafted film, which is a distinctly unique blend of documentary and narrative filmmaking. Many films that come along are hailed as the first to accomplish a certain feat. Some say Gillo Pontecorvo's The Battle of Algiers (coming later this year from Criterion) revolutionized political docudrama, while others give the same accolade to Steven Soderbergh's Traffic. Both of these superb films show trademarks from Salvatore Giuliano, which preceded them all. Rosi is less concerned about discovering who killed Giuliano. That detail is secondary to the complex circumstances that led to his demise. Following WWII, Italy found itself in political turmoil. Wealthy leaders want the scourge of fascism to be wiped from the political spectrum, desiring to attain independence for their homeland of Sicily. They choose to utilize bandits from the countryside, effectively "squeezing the lemon, then throwing it out." Salvatore Giuliano is the ultimate Robin Hood figure, taking from those in power, and giving the power to the people. After independence is attained in 1946, the struggle has not ended. Those who acted against the government are pardoned, but someone must hang. Giuliano is not about to give up power, taking issue with all who seek it: policemen, communists, socialists, carabineiris, mafia�he is at times involved with some, and attacking others. His loyalties are only to his name, and no other. Like those who used him before, Giuliano uses peasants to exact his will. Blackmail, kidnapping, and covert attacks are the game. When he goes too far and orders the massacre of a group of communist peasants at a rally in Portella della Ginestra, the die is cast. Slowly, Giuliano's system begins to unravel. 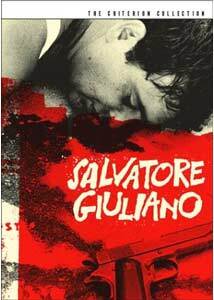 What is so intriguing about this film, aside from the political and social complexities so deftly depicted, is the fact that Giuliano has very little screen time. He is more accurately described as a presence, seen in the background wearing a white coat and brandishing a rifle. He is just short of a mythical figure, and Rosi knows how to capture this on film. Structured in a nonlinear fashion, Rosi intercuts current investigations into the death of Giuliano and the events that led up to it. We travel back and forth freely in time, demanding the utmost attention of the viewer. Similar to Kurosawa's Rashomon, this is an investigation of truth, revealed layer by layer. Rosi utilizes the real locations and streets where these events occurred and talks to the actual residents who had firsthand experience (there are only two professional actors in the entire film). Pieces of the puzzle slowly assemble to clear away the fog of mystery. As previously mentioned, Rosi's style is a blend of standard narrative filmmaking with a sense of immediacy provided by documentary techniques. He is clearly influenced by Italian neorealism, and the straight-cut editing style of the French New Wave. His use of the weathered Italian locations is fabulous. Composition and framing of shots is unique and masterful, especially in the lengthy trial scene. Rosi uses the limited space to great effect, creating a sense of claustrophobia, and some of the shots reminded me of spaghetti westerns of the period. Musical score is kept to a minimum; the events are riveting enough without the enhancement of excessively brooding underscore. It is not difficult to see why this film is praised by filmmakers like Coppola, Scorsese, and Fellini. Clearly, Rosi was on to something. His unique blend of styles creates a riveting portrait of a mysterious man, whose criminal activities are not glorified, but simply examined. Even though Giuliano broke the law, he had an integral hand in shaping the future of Italy, much to the chagrin of those who pursued justice. Image Transfer Review: The picture quality is simply outstanding. Criterion's anamorphic 1.85:1 transfer perfectly captures Rosi's exquisite black-and-white images. Contrast is rock solid and grain is extremely minimal. The image does not suffer from digital overenhancement, and fine detail is evident. This probably looks better than it did when it premiered in 1961. Audio Transfer Review: Unfortunately, the monaural audio is not as outstanding. Italian films are notorious for bad recording quality. Since most Italian cinema is completely dubbed in postproduction, dialogue frequently does not match with the actors. This is normal, and is not a transfer defect. The mix simply suffers from a lack of quality source material, and sounds very thin and muffled at times. This is as good as it can sound. Extras Review: Disc one contains a feature length audio commentary by film historian Peter Cowie. Like Stephen Prince's excellent commentaries for Criterion's recent Kurosawa releases, Cowie delves into the art of Rosi's filmmaking, the political history depicted in the film, and biographical information on those involved. This is an interesting effort that is well planned and includes quoted excerpts from a recent interview of Rosi. Criterion has filled a second disc with three extras. First, Witness to the Times (18m:43s) is a piece produced in 2003 exclusively for the Criterion Collection. It contains interviews with Francesco Rosi and writer Tullio Kezich. Rosi discusses his love for film of all kinds, and how neorealism plays into his work. The topic shifts to Salvatore Giuliano, and its influence. Kezich, who documented the production, provides some interesting information on the exhaustive research that went into the film. Nothing was included unless it was fact. Actual photos are compared to shots in the film. It is difficult to tell the difference. Next, an excerpt from an Italian newsreel (3m:03s), dated July 12th, 1950, shows a news report of the day on the death of Giuliano. It discusses the events surrounding his murder, including his heinous crimes and the trial of the massacre at Portella della Ginestra. Included is graphic footage of the actual Giuliano in the morgue. Finally, in Il cineasta e il labirinto (55m:38s) director Francesco Rosi himself takes us on a comprehensive journey through his cinematic life, and his films. Originally pursuing law when WWII broke out, Rosi began working in the theater. He eventually got a job as an assistant director with acclaimed director Luchino Visconti. This is a great portrait that includes comments by directors Martin Scorsese, Giuseppe Tornatore, and many other important figures. Scorsese talks about the film's clarity and how he looked back to it several times while making Taxi Driver and Raging Bull. If you need proof of how amazing Criterion's transfer is of the film, just look at the horribly washed out clips in this documentary. Salvatore Giuliano is a triumph of political and historical filmmaking. While no film that depicts true events offers a truly objective view, Rosi successfully recreates the settings and happenings of a very turbulent time in Italian history. Criterion's effort is simply amazing, as always.